How Do You Stop A Dog From Digging Under A Fence? When you have a pet, there is no doubt it will need attention. One of the most common ways for a dog to tell you that it is bored is by digging. It’s not the only way of course that it will show you, but if your dog is digging, there is something it is lacking. Dogs love to dig, it’s in their nature, but you don’t really want a dog digging under your fences to get out, and there are many ways you can react to this sort of behavior and it begins with working out why your dog is digging. Dogs who are bored also love to try and jump fences or escape through gaps and can often be found stuck in broken fences through failed escape efforts. Dogs are great escape artists, and if your fence has any type of weak point, your dog will find it and get out through it. This is why dog-proofing your fence – or installing a fence specifically designed to keep pets in, and pests out, is imperative. This not only keeps your pet safe, but also ensures people in your community aren’t frightened by your dog and keeps other people’s dogs out. Some dogs were bred to dig – how do you combat that? Dogs also find digging entertaining, not specifically because they lack in other areas of entertainment, but because they find it fun. Specific breeds of dogs, like terriers, were bred to dig, and other dogs that are pups or juveniles may just need an outlet for their massive amounts of energy. No matter how much your dog digs, whether a little or a lot, if they start digging under fences they can escape, and you need to act to ensure they don’t get out. As mentioned, if your dog wants to escape bad enough, they will find a weak point in your fence and get through it. 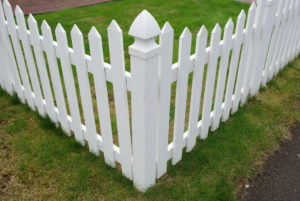 When you are getting a new pet or showing your current pet less attention than normal, they may try to find an easy way to get out of your yard, and small gaps in fencing can become big ones with a bit of commitment from a bored animal. Check your fencing for small gaps that may allow your dog to get out and check the lower sections of your fences for space that can easily become bigger with digging. Also, check for areas at the top of your fence that might be easily accessible for jumping dogs. Dogs are surprisingly good jumpers and can jump up to six feet into the air. If there are items in your yard near a fence like a table, chair, or even garden beds, it might be just enough extra height to get your dog over the fence. You can combat jumping dogs in two ways, one is to make sure there are no items dogs can launch over the fence with, and the other is to make your fence taller at the weak points. There are many types of fencing that will stop your dog from escaping. Below your fence line is usually just soil. A common way to combat digging through this soil is to add an extra ‘fence’ below your fence. Chickenwire or your whole fence dug about 1-2 feet below the ground is one way, large rocks at the base of the fence is also another way. However, there are many other specific types of fencing that your local fencing professional can discuss with you, to sort your specific issues. There are many options like concrete footing, L-shaped footings and more. If you want to stop your dog digging under the fence, give our professional team a call today for a fence that will work! Previous Previous post: What Is A Privacy Fence? Next Next post: How Do You Remove A Fence Post?